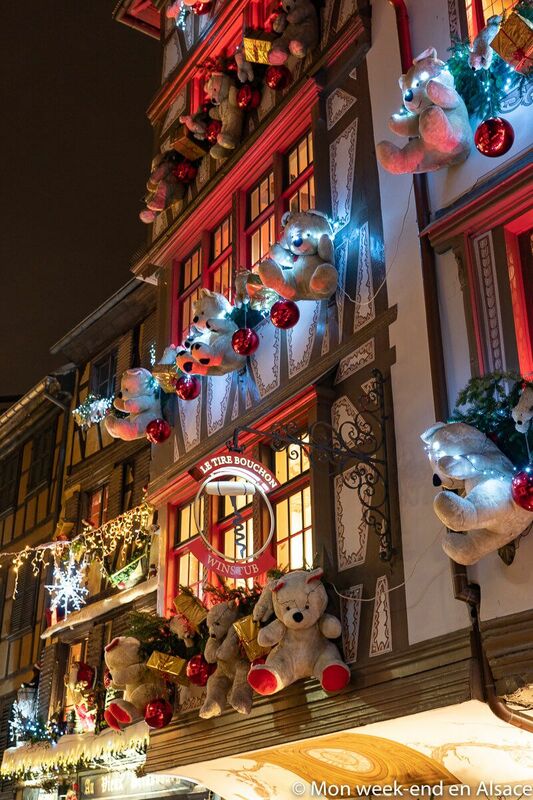 Strasbourg Christmas Market is probably, with Colmar Christmas Market, the most famous market in Alsace. 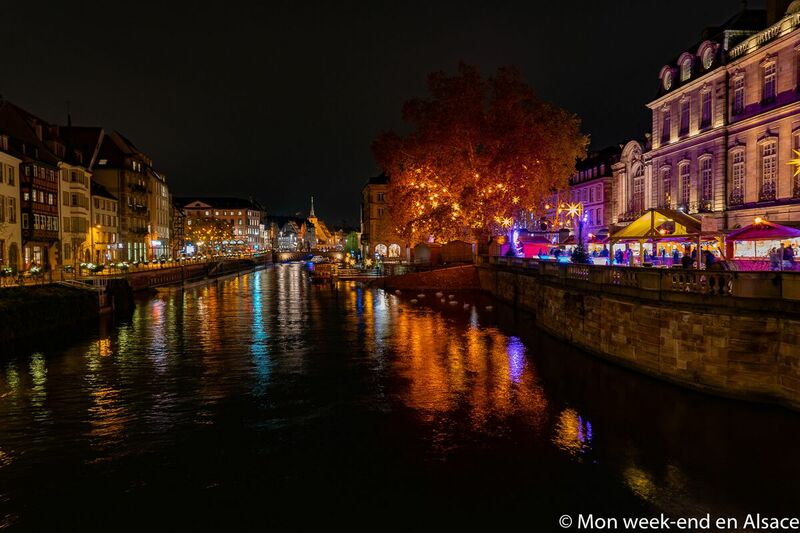 It should be said that this tradition is not new: far from being an event created for tourists, Strasbourg Christmas Market (called Christkindelsmärik) dates back from the Middle Ages, making it one of the oldest European markets! The reason why I never wrote about this market before, is that I didn’t enjoy it so much a few years ago: it had lost its soul, giving in to the siren calls of stands with very industrial products and with sometimes the appearance of a funfair. Fortunately, the city pulled itself together (and sorted the choice of stands!) 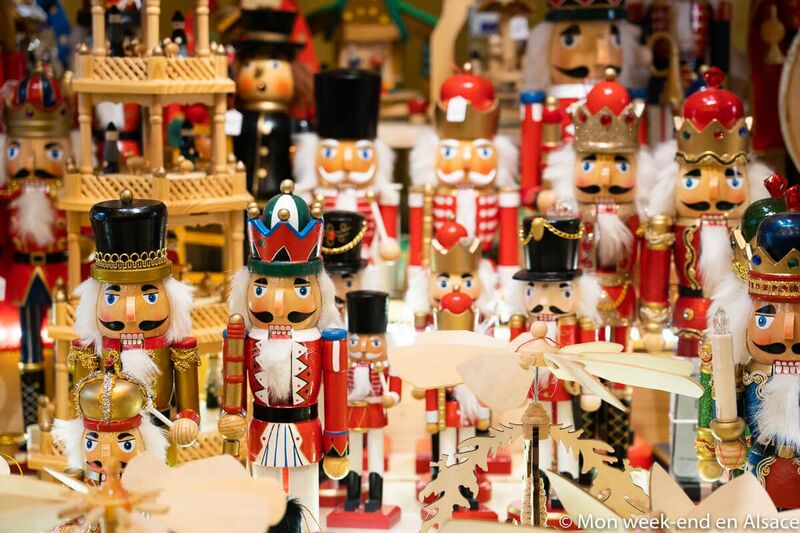 and I can now fully recommend it: Strasbourg Christmas market is really worth it! It would be difficult to tell you everything about this big market, but I’ll try, in this article to guide you, as I would with friends coming to visit. So, are you ready? Follow the guide! Rue du Maroquin. Just magnificent! Rue Mercière. Very well decorated, with a splendid viewpoint on the cathedral. Le Carré d’Or, where you’ll find some of the most beautiful shops of Strasbourg. Have a look at Rue des Hallebardes and in the surrounding streets to admire Baccarat crystal chandeliers and very rich decorations! The illuminated docks. 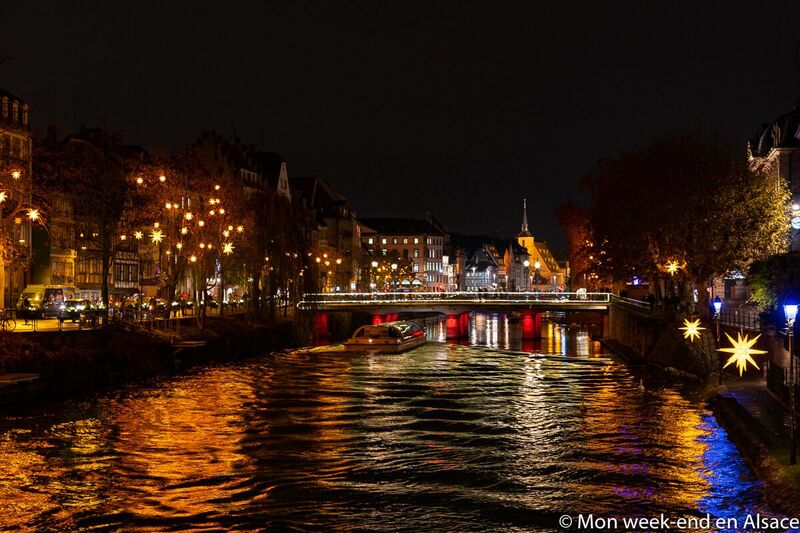 Go and have a look a the Quai des Bateliers at dusk and have some fun crossing the small bridges over the Ill in one direction and in the next one… it’s magical! The façade of the Pâtissier Chez Christian, on Rue de l’Outre. It’s one of the best pastry chef in Strasbourg, and the painted façade is beautiful yearlong. It’s even more mind-blowing at Christmas! L’arbre bleu, place Gutenberg. At night, I love admiring its whittled branches standing out in the dark! The OFF Market in Strasbourg, for a completely alternative and very local atmosphere. 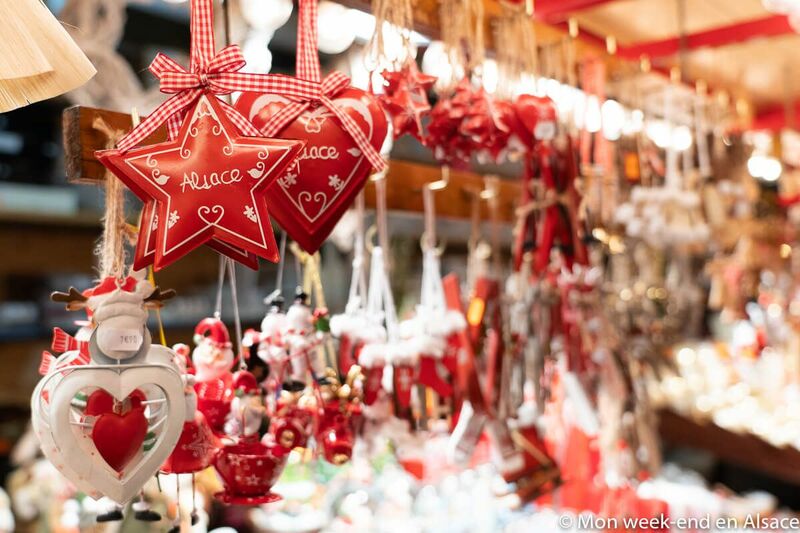 One Christmas Market, several locations! Place Kléber. 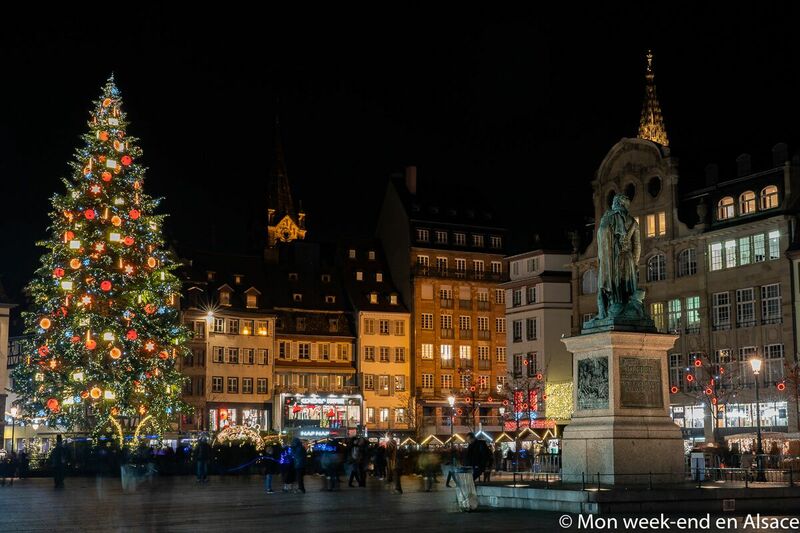 It’s one of the main squares in Strasbourg, hosting every year the celebrated Giant Christmas Tree (30m tall! It is really magnificent!). You’ll also find a few chalets of associations (including “La soupe étoilée”, that I’ll mention later on in my tips! ), and a skating rink. Place de la Cathédrale and Place du Château. Around the (splendid!) Cathedral of Strasbourg. Place Broglie. It’s the City Hall square in Strasbourg. Place Gutenberg. That’s where you’ll find every year the chalets of the guest country (Finland in 2018). In front of Rohan Palace and the Place du Marché aux Poissons. Food lovers, that’s where you’ll find the delicious gastronomy stands. It’s the Market of Delights! Place Benjamin Zix. In the famous Petite France, the most touristy and beautiful area of Strasbourg! Place des Meuniers. Also located in the Petite France, it’s the location of the market of the Irréductibles Petits Producteurs Alsaciens. 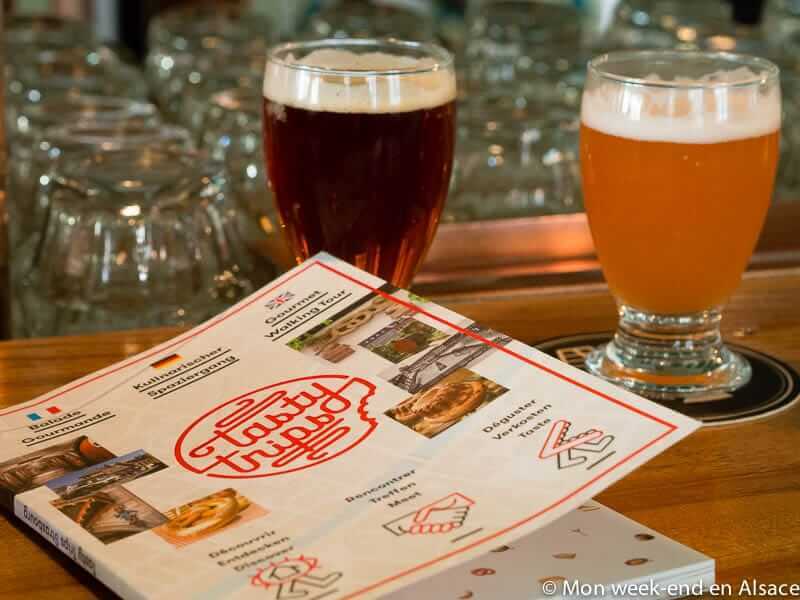 You’ll find there only excellent local products (cheese, beer, flour, honey, jam…)! Place Grimmeisen. That’s where you’ll find the “Off Market”, a social and solidarity market more aimed at locals (but visitors are also of course welcome!). Place Saint-Thomas and Place du temple-Neuf. Smaller, but still nice markets. 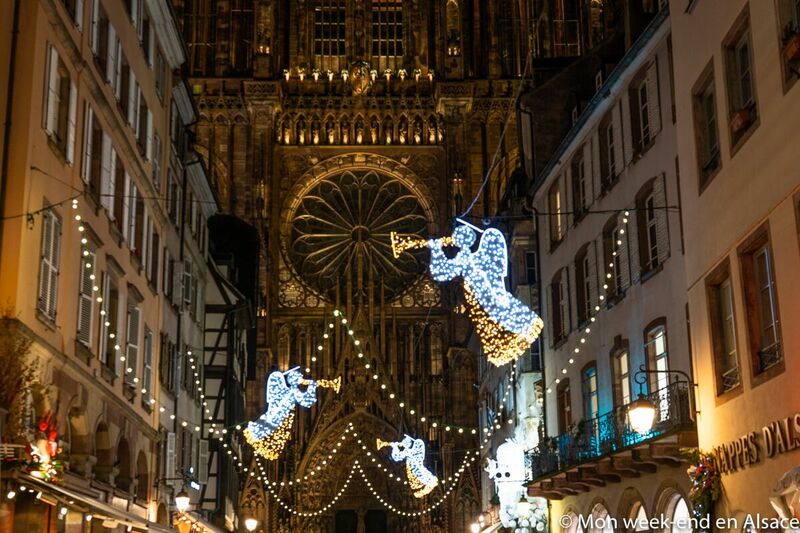 It would be impossible to mention all events and activities offered in Strasbourg at Christmas time: there are so many! Let’s mention for exemple the stunning nativity scene in the Cathedral, a story ride onboard a Batorama boat, a walk with a night watchman, guided tours on the theme of Christmas traditions, concerts, workshops and shows for children, conferences, arts and crafts exhibitions… You can have a look at the detailed programme here. 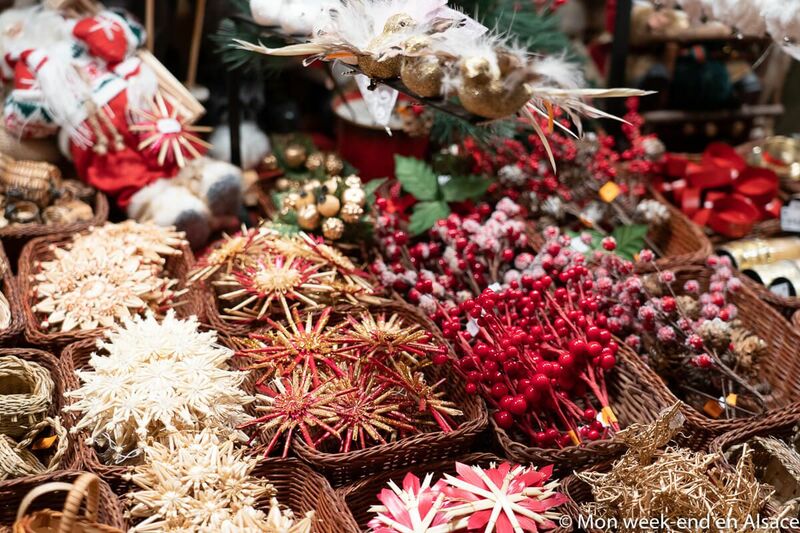 If you visit the market with children, don’t hesitate to read our article dedicated specifically to Christmas Markets in Alsace for families. 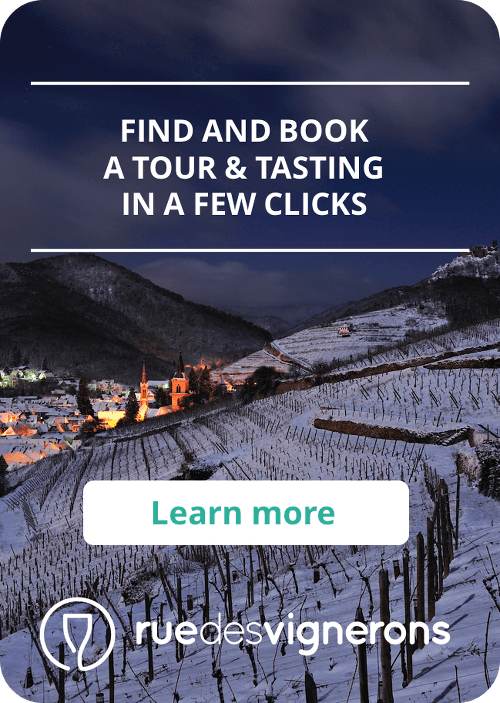 The best mulled white wine (made with Alsatian wine! ): La Tribu des Gourmets, on the terrace of Rohan Palace (river side) and Place Saint-Etienne. 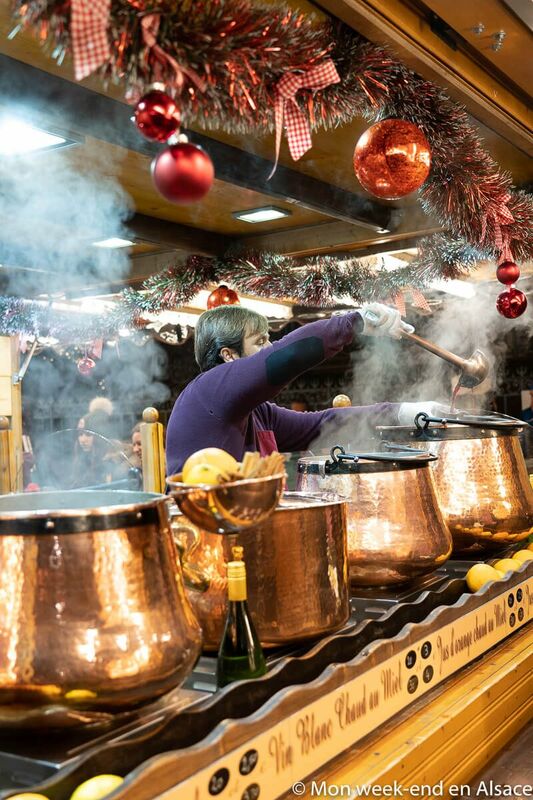 The best mulled red wine: Chez Mathilde, place Broglie: an institution! You’ll probably find there locals grabbing a drink after work… it’s a famous meeting place! The best warm beer: Uberach, a craft brewery from the North of Alsace, located place des Meuniers. It’s perfect for a change from mulled wine! 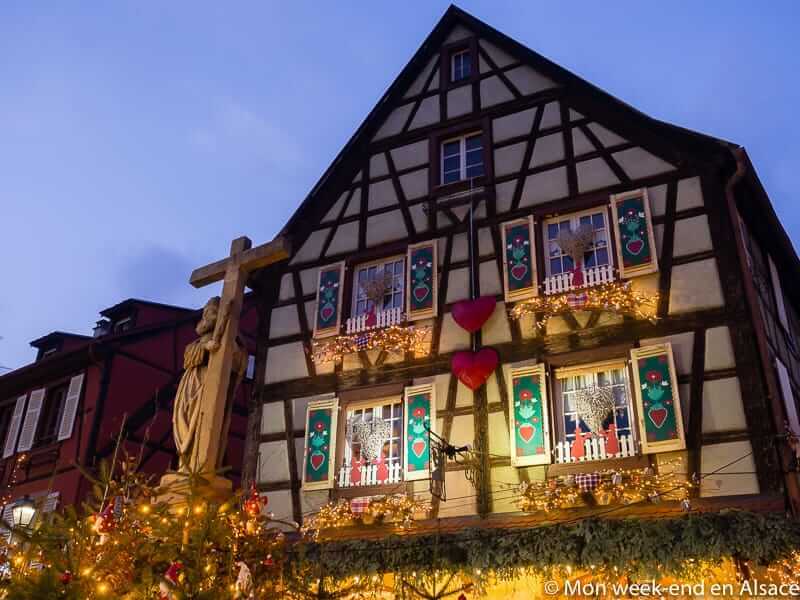 The best gingerbread: Mireille Oster, place Broglie: known to make the best gingerbread in Alsace (and having tried a lot of them, it’s probably true!). Chez Mathilde also has excellent gingerbread (a bit more moist, which I also love! ), as well as other cakes (if you like Linzer Torte for example, go for it: it’s a masterpiece!). The best soup: Humanis, place Kléber. A soup prepared by Alsatian starred chefs, whose takings will go to associations… the best way to mix tasting pleasure and a good cause! 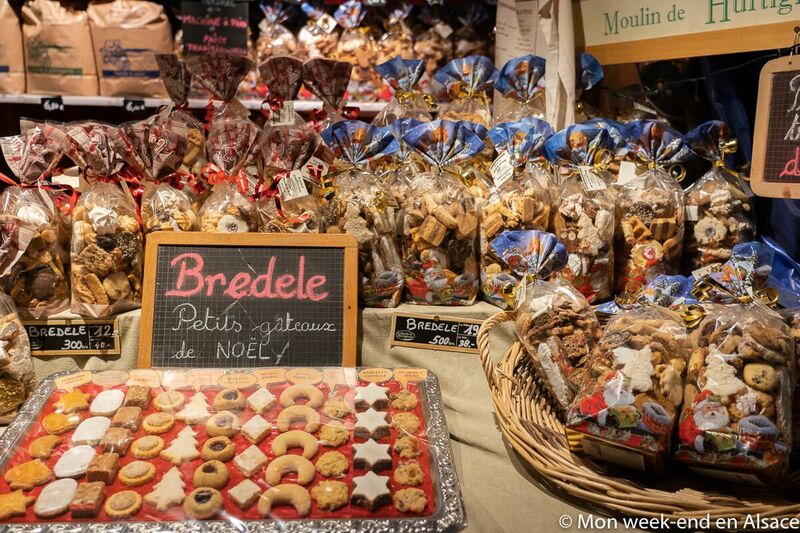 The best bredele (small Alsatian Christmas biscuits): it’s hard to tell, but based on those I’ve tried for now, the best bredele are at Moulin de Hurtigheim, place des Meuniers. Those from Boulangerie Woerlé, on the terrace of Rohan Palace are also very good. For gluten-free bredele, you can check out the Boulangerie l’Eden libre de Gluten, Place du Temple Neuf. 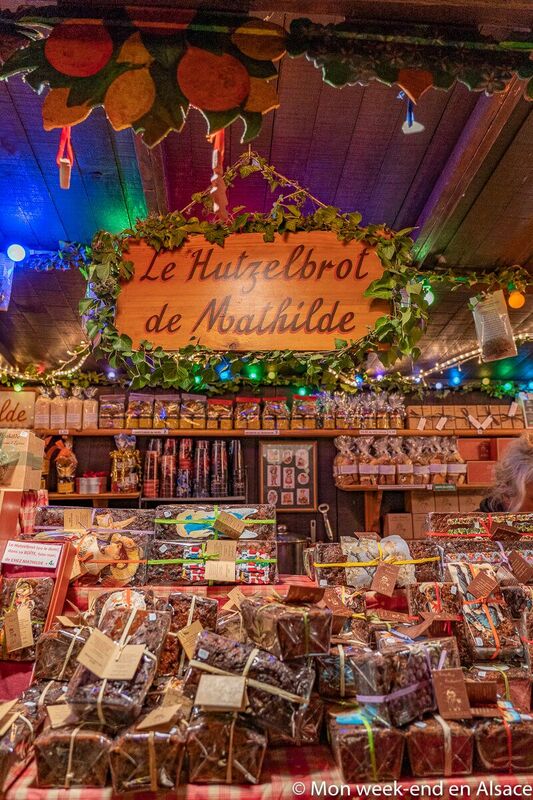 As a general rule, to buy good local products, the best is to go to Place des Meuniers, where you’ll find the Market of the Irréductibles Petits Producteurs Alsaciens, or to the terrace of Rohan Palace, where you’ll find the Marché des Délices. Alsatrucs, place Broglie. I’ve already mentioned the objects from Alsatrucs that I really love: beautiful objects created by craftsmen, reusing traditional Alsatian symbols and adding a touch of modernity with very original designs! Boules de Meisenthal, place Benjamin Zix. These are glass Christmas balls entirely handmade at the Centre d’Art Verrier in Meisenthal, located in Lorraine, very close to Alsace. It’s outstanding work and a beautiful collection of traditional and modern balls. Indeed, every year, one designer creates one new ball… bought all throughout December! They are splendid. Poteries de Soufflenheim, place du Marché aux Poissons. It’s the perfect chalet to buy real Alsatian potteries coming from Soufflenheim. Caroline Courroy, place Broglie (on the same aisle as Alsatrucs). Objects made with fabric (pillows, pouches, tote bags… ) and reusing Alsatian symbols in a modern way. Just great! Käte Wohlfart, place du Château. A huge chalet filled with Christmas decorations, all prettier than the next. There is often a queue to get in! 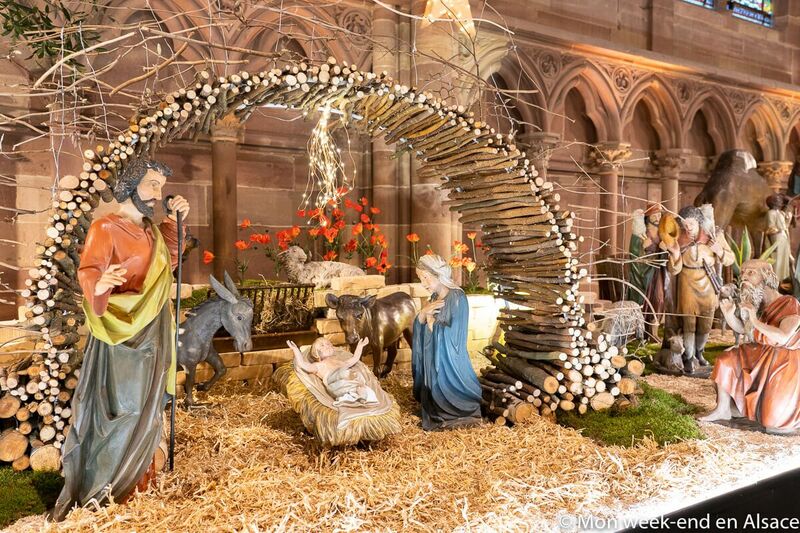 Un Noël en Alsace, 10 rue des Dentelles. 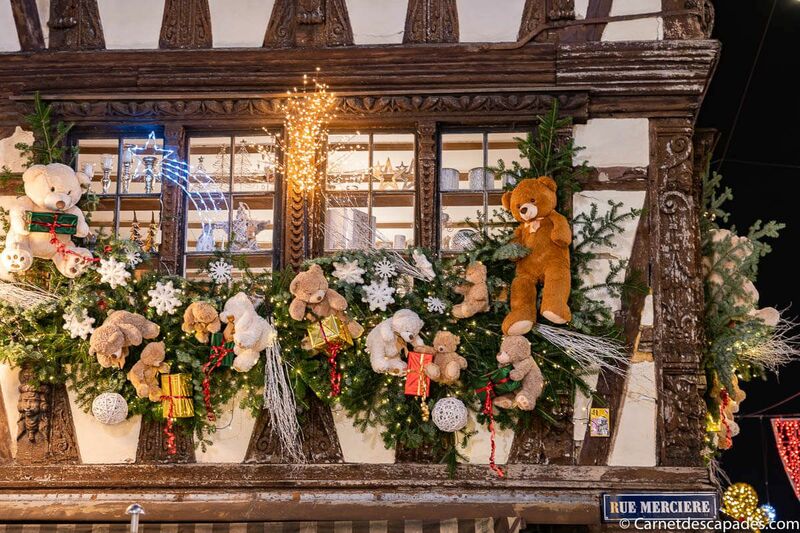 A shop (open yearlong) selling beautiful Christmas decorations. La Maison de Hanssen et Gretel, 7 rue du Chaudron. A shop (open yearlong) selling Alsatian arts and crafts of very good quality! Dress warmly! A big pair of socks or two pairs of socks and warm shoes (if you have fur lined shoes, it would be ideal) will help you to still feel your toes at the end of the day ;-) Don’t forget to bring several layers of clothing, a hat, a scarf and gloves! 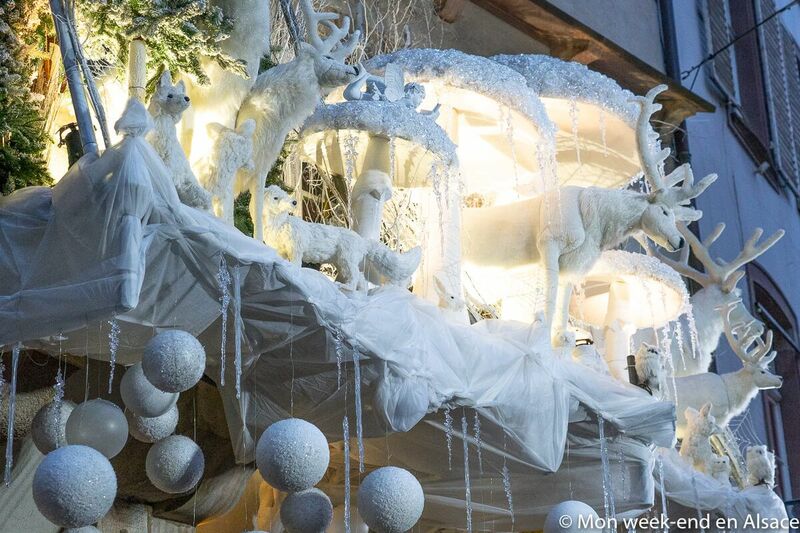 Plan to stay for a while to see dusk: the illuminations and decorations will then be even more beautiful! If you can, really try to come during the week, as your experience will be entirely different: it’s way more pleasant than during the weekend with the crowds. Coming to Strasbourg by car is quite complicated at this time. Try to favour park and ride services, to park your car for a small fee and include your tram ticket to get to the city centre. Try to park in the mornings, as there might not be any spaces left at the beginning of the afternoon during weekends! Book REALLY early your accommodation: in Strasbourg, it’s not uncommon to book 6 months (or even sometimes a year!) in advance. Remember to also book restaurants at the earliest time possible! 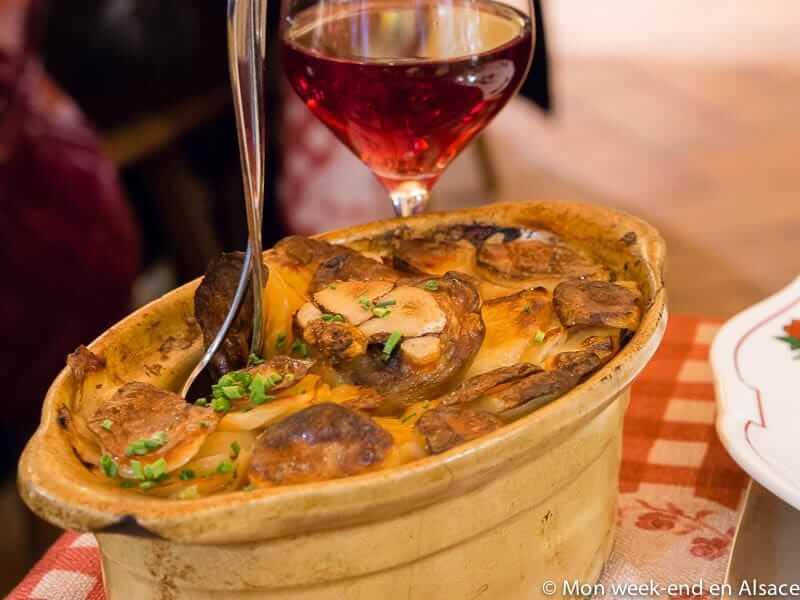 Click here to see the list of my favourite restaurants in Strasbourg. The size of the market: you can walk around for hours (or even days)! The weekend crowd: it’s hard to put one foot in front of the other! 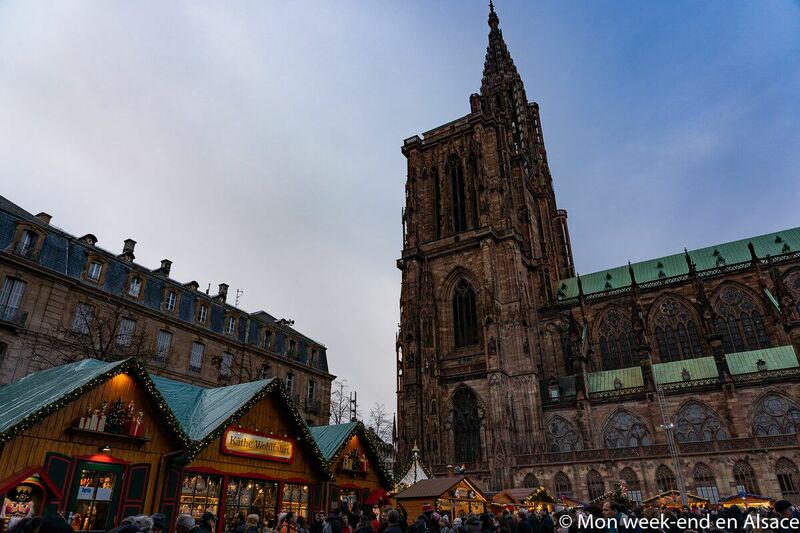 You will find here the opening dates and times for Strasbourg Christmas Market.